Are you sitting comfortably? It’s a bit of a long post today, but I hope you’ll think it’s worthwhile. 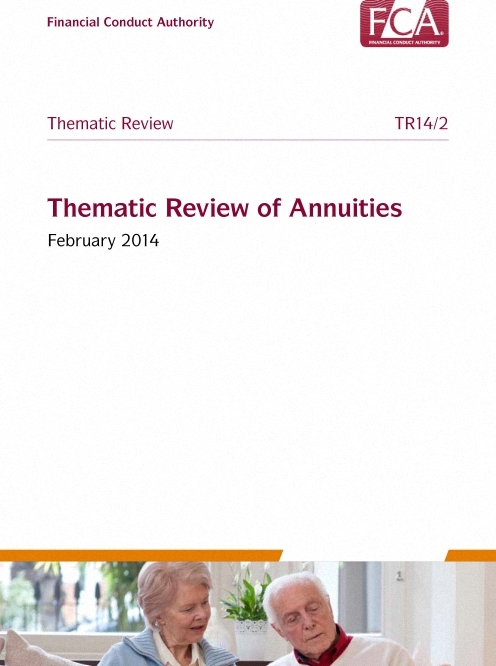 If you add in the thematic review of annuities from February this year (37 pages), it’s four reports and 277 pages for me to wade through. Why this couldn’t be a single report of less than 50 pages I have no idea. At least they are downloadable PDFs. It reminds me of the insurance scam. Apart from legal obligations like driving, and catastrophic consequences like your house burning down, insurance is poor value for money. If you can take the long-term view you’ll be better off keeping the risk for yourself and not paying someone else’s profit margin. Back to annuities: the rate this morning for an index-linked1 annuity for a 55-year-old male (that’s the age at which I will start to drawdown my SIPPs) is £2,899 per £100,000 or 2.9%. I think I can produce an annual 2.9% myself, and if I don’t, I have a minimum of 34 years before my pot runs out (100% / 2.9% = 34.5). The cost of the guarantee (which is just as much an upside limit as a downside one) is huge, and you would have to be extremely risk-averse to find this attractive. If I wait until 65, and give up the inflation protection, I can get 5.9% from a flat annuity. This takes the payback period to age 82, and leaves me at the mercy of returning inflation. According to the ONS, my life expectancy at age 65 is 83, so if we ignore inflation I am marginally ahead. The fact that the inflation-proofed rate at age 65 drops to 3.8% (and a breakeven age of 91) tells the true story. At the very least, the recommendation must be to wait and see if your inflation-proofed annuity rate ever produces a break-even age you can live with (until). 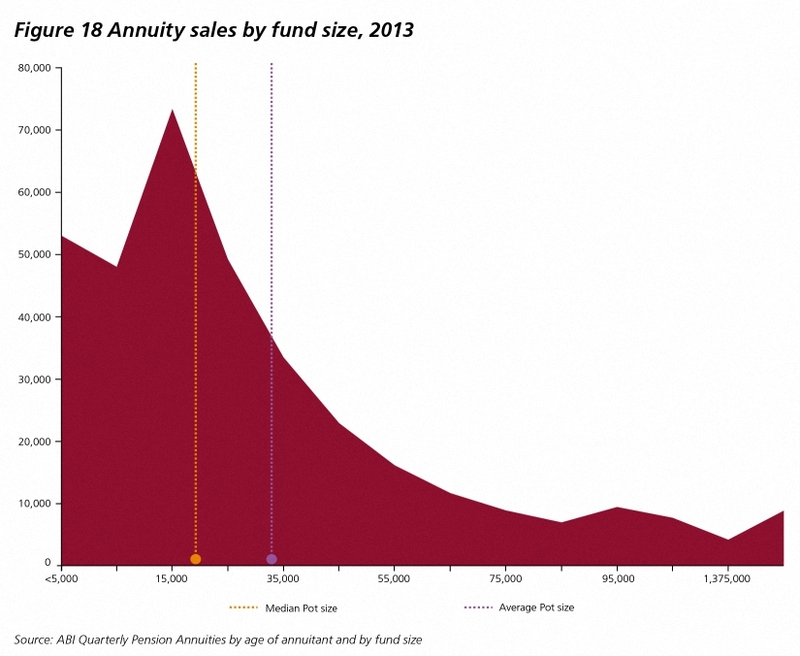 You can always buy an annuity next year, but you can’t un-buy the one you bought last year. The conclusion was that the market wasn’t working, and the follow-up study was charged with finding out why. Following the government’s announcements on increased pension freedom from April 2015, the scope was widened to look at how the market might evolve after April. The new report again finds that the market is not working well for consumers – they are not shopping around for annuities, even though (perhaps because) the public perception is that annuities are poor value. The FCA dispute this perception, and I will come to this later. This customer inertia has led to few new entrants into the decumulation market. In addition, consumers underestimate longevity, inflation and investment risk. They also suffer from framing issues (making different decisions depending on how information is presented). 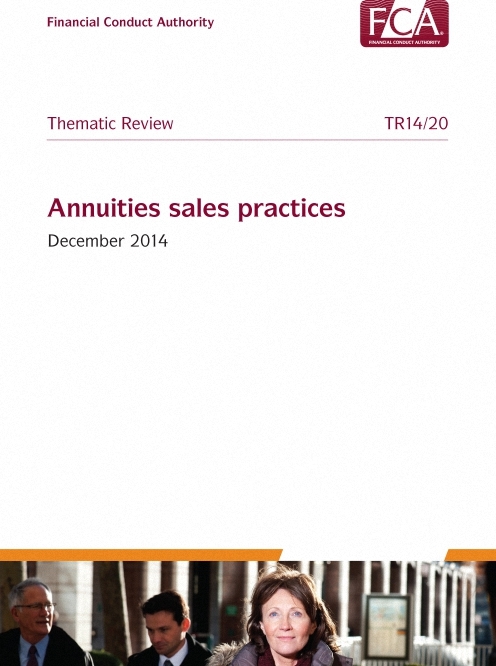 The FCA expects hybrid products between annuities and drawdown to emerge. Though these will be welcomed by consumers, the risk is that the increased complexity will make comparisons difficult and increase inertia still further. The FCA wants to see improved communication from providers to overcome this. 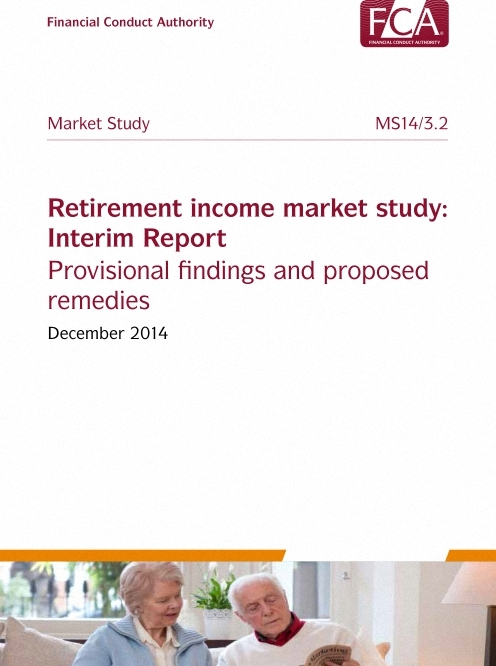 They also see drawdown products being sold to people with much smaller pension pots than before. Present information in a way that supports good-decision making rather than drives sales (ie. eliminate framing effects). Heuristics (rules-of-thumb) could be useful here. Develop a Pensions Dashboard for all retirement products. One of the most shocking graphs in the report is the one above showing the distribution of pension pot sizes. The median value is under £20K, and the mean below £35K. The age distribution is less surprising. Sales peak in the “round years” of 65, 60 and 55. For smaller pots the return is lower (eg. 87% for a £10K pot – which the FCA see as fair, since admin costs don’t vary by pot size). 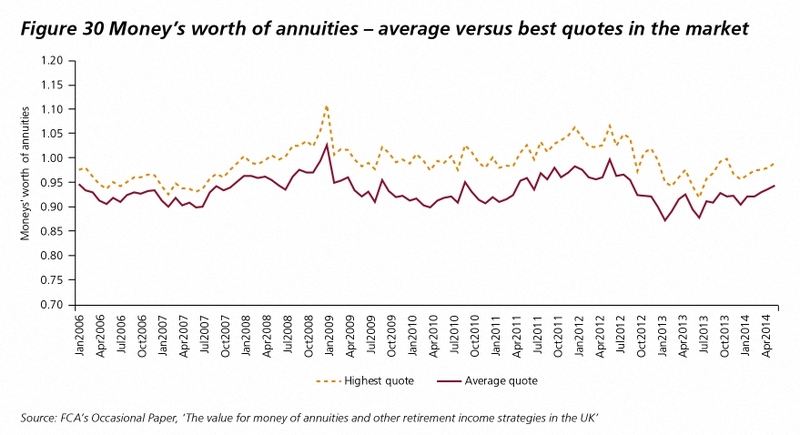 Annuities bought from the existing pension provider also return less. Guaranteed annuities (fixed payments for a number of years) are worth it only for the over-75s, and inflation-linked annuities (5% pa) are always lower value for money. 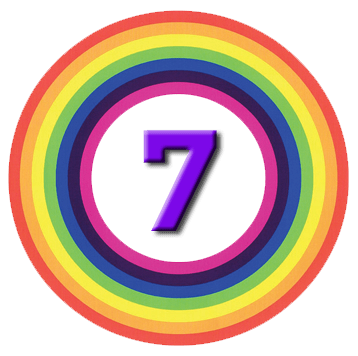 So the very best spin we can put on annuities is that you are buying longevity insurance at a cost of 6% (if you shop around, and if you have a moderately sized pot – which as we have seen, most people don’t). How do the FCA produce these results? 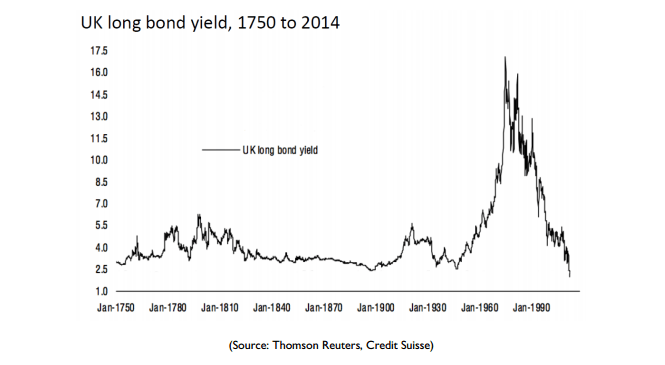 Well the main trick is to discount the future annuity payments at the “risk-free” rate, which seems to be the UK government bond yield.2 This is of course at a record low, so low in fact that we have seen a global “hunt for yield” over the past few years. This is one step up from sticking the money under the mattress. The report goes on compare a range of bond-based strategies (amortisation to 100, and to 85, self-annuitisation and 1/ life expectancy) which all produce lower returns, except for A85, where the risk of living longer than that is deemed unacceptable. It seems unlikely to me that a person who goes into drawdown will buy a ladder of government bonds, so why is this the benchmark, rather than a diversified portfolio of global stocks, property etc? The key factor here is that self-annuitising is not the optimal drawdown strategy. 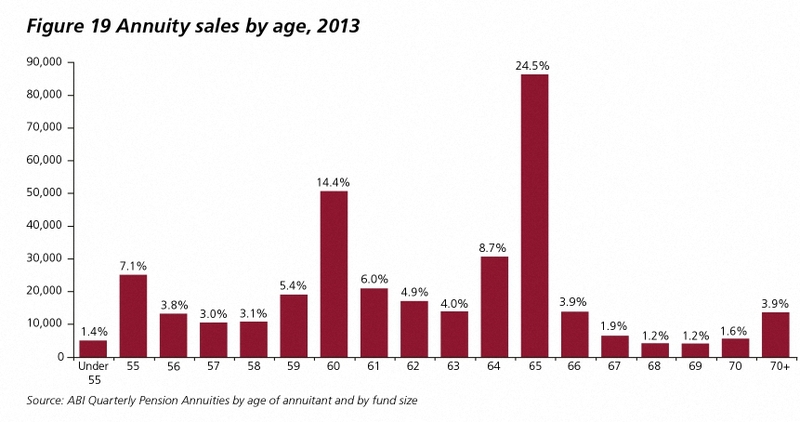 Taking 5.9% pa out of your pot from age 65 is risky. Most DIY investors would recommend a 4% drawdown, or even 3.5%, and would target a pot of constant size, from which they can withdraw indefinitely. 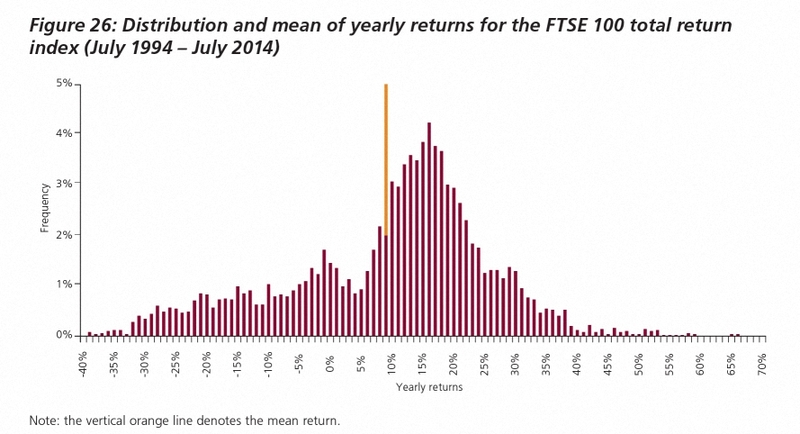 The FCA analysis used the daily annual returns from the FTSE-100 from 1994 to 2014, with a mean return of 9% and considerable volatility (as shown above). This the basis for the creation of 10,000 possible futures by randomly assigning from this distribution to each year of each scenario. The results are below. I do not question the arithmetic, but I fail to understand why the FCA would choose draw-down rates much higher than any drawdown advocate would recommend, and then describe the outcome as too risky. I agree it’s too risky, so take out less each year. One might be tempted to think that the nanny state is more concerned with pensioners taking the “safe” option (annuities) – and thereby reducing the chance they may become a burden on the state – than the right (“risky”) option. The industry recommendations from the report are all mom and apple pie, but really this is 250 pages of deck chairs on the Titanic. 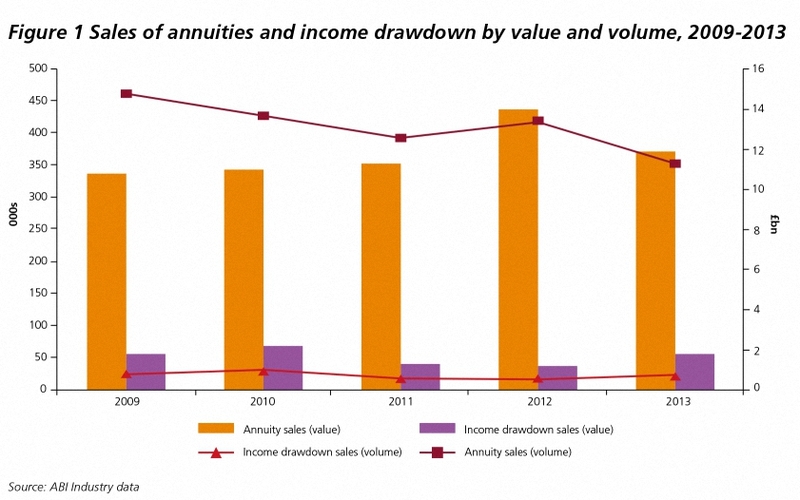 There may be a mis-selling scandal here, which is what many commentators have picked up on, but the real scandal is the chart below, which shows that 85% of people (by value, it’s even worse by volume) are still choosing annuities over drawdown. Instead of sending people a smaller wake-up pack at age 55 or 65, we need to be signing people up to a lifetime retirement plan in their 20s, and checking their progress towards it at regular intervals. Work backwards from the end, don’t start there. The government needs to look at replacing the abysmal NEST with a state-backed global multi-asset fund costing less than 0.5% a year, underwritten to perform as well as an annuity. That would save a lot of trees, a lot of money, and save us all a lot of worry. 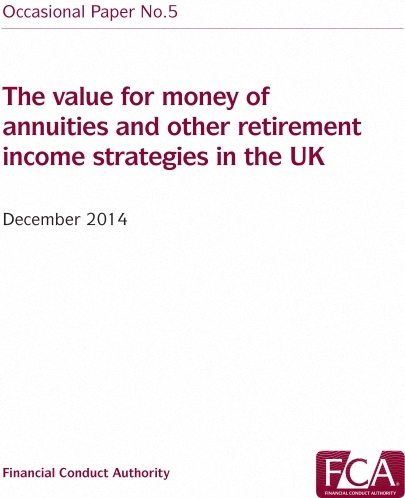 The FCA saying that annuities are good value (if only people would shop around) won’t help things. There is a real danger that this report will save annuities, only months after Osborne’s reforms looked to have killed them off. But I won’t be buying one.